The cool rounded corners of this single wall-mounted vanity add a soft contemporary touch to modern bathrooms. With 2 drawers with soft closing Blum slider, this bathroom vanity is modern simplicity at its best ideally suited to small bathrooms and en-suites. The cabinet is constructed using the Highest Grade MDF, Engineered for Moisture Resistance. 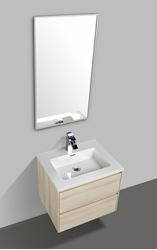 The beautiful white basins with rounded corners and unique angles/ design is made of highly durable acrylic-resin with integrated rectangular overflow. Available in various finishes ensures that regardless the color scheme at hand, anyone is sure to complete their space with guaranteed cutting contemporary chicness. The price is for the basin + cabinet only. It excludes the mixer, the basin waste or mirror. This model is also available in 600 mm L with 1 drawer, 900 mm, 1200 mm l and 1500 mm L in all above colours. Matching tall cabinets and compact side cabinets available.